Archaeological sites and museums in Greece typically follow winter hours from November 1 to March 31, and summer hours from April 1 to October 31, though the Ministry of Culture and Tourism can change them and revoke free admission days without advance notice. For the 2015 tourist season, the 46 most popular sites are open 8:00-20:00 daily from April to October, except holidays listed below in ‘Closures.’ See “Archaeological sites and museums in Greece open late” to learn which ones they were. More locations may switch to extended hours, if/when announcements are made. There is no longer a mass switch for all tourist sites on April 1 due to austerity and lack of funding/staff. Visitors should be aware of dates when tourist sites are closed to avoid disappointment and take advantage of the generous number of free admission days. *Article last updated May 5, 2015. Because hours vary by location, I use “sunrise to sunset” year round as a general rule and stay away on Mondays. This has worked fine for me as a traveler for 20 years, without need to memorize schedules, look up information or call anyone. I also prefer to go near closing time to avoid tour groups and schoolchildren in the morning and to shoot photos at sunset when the colors are more intense. Privately run museums keep different hours and are generally unaffected by strikes. — In spring/summer, 8:00-20:00 daily, except on national holidays when it opens 8:00-15:00. — Between April 1 to June 16, 8:00-19:00 Monday-Friday and 8:00-15:00 on Saturday, Sunday and national holidays. — In winter, 8:00-17:00 daily and 8:00-15:00 on national holidays as of October 28, 2012. *The former ministry on May 17, 2011 promised to keep the Acropolis open 8:00-19:00 Monday-Friday year round, but this has been revoked. Acropolis Museum of Athens — From April 1-October 31: Mon 8:00-16:00, Tu/Wed/Th/Sat/Su 8:00-20:00 & Fri 8:00-22:00 (Press Release, Naftemporiki). From November 1-March 31, Mon-Thurs 9:00-17:00, Fri 9:00-22:00 and Sa/Su 9:00-20:00. As of January 8, 2013, the museum is no longer open 8:00-20:00 year round. See Summer and Winter opening hours at the official website. Aegina Afaia Archaeological Site — Open 9:30-16:30 daily. Aegina Afaia Collection — Open 10:30-13:30 daily. Ag. Triadas Archaeological Site — Open 10:00-16:30 daily. Ancient Agora/Stoa of Attalos — In winter, open Tuesday-Sunday 8:00-19:00 and Monday 11:00-19:00. Ancient Messinia Archaeological Site — In winter, normal hours. In summer, 8:00-20:00 daily. Ancient Olympia Archaeological Site and Museum — In winter, hours are 10:00-17:00 Monday, 8:00-15:00 Tuesday through Friday — Ta Nea (in Greek). Museum reopened May 10, 2012 on the date of Olympic flame lighting ceremony, after 75 artifacts were stolen in February 2012. — History of Olympic Games Museum open 8:00-15:00 daily, except Monday when it operates 10:00-17:00. Corfu (Kerkyra) Fortress — In winter, 8:00-16:00 daily. Crete Heraklion Archaeological Museum — In winter, open Monday, 13:00-20:00. In spring and summer from 8-8 daily. The entire museum reopened to the public on May 6, 2014, after partial access on August 14 and November 4, 2012 and August 1, 2013. Admission is 4 euros. Crete Heraklion Gortyna Archaeological Site — In winter, normal hours. In summer, now open usually from July 1, 8:00-20:00 daily and national holidays 8:00-15:00. Crete Knossos Archaeological Site — In winter, 8:00-17:00 daily. Crete Minoan Palace of Zakros in Lassithi — In winter, 8:30-15:00 daily. In summer, 8:00-18:00 daily. Crete Phaistos Archaeological Site — In winter, 8:30-15:00 daily. Crete Spinalonga Island — In winter, closed. In past years, it opened Sa/Su 9:30-16:00 but this is no longer the case. Kerameikos in Athens — In winter, normal hours. In summer, now open 8:00-20:00 daily. 8:00-17:00 weekdays and 8:00-15:00 weekends. Kimolos Archaeological Museum is a seasonal (summer only) museum. Maria Callas Museum — Closed since 2008 and scheduled to reopen in 2015. National Archaeological Museum of Athens — In winter, 8:30-15:00 daily, except Mondays from 13:30-20:00. Entire halls may be closed to visitors and the museum shop is sometimes closed Sunday/Monday due to understaffing. Pella Archaeological Museum — In winter, 9:00-16:00 daily. In summer, 8:00-20:00 Tuesday-Sunday and 10:00-18:00 on Monday. Psychro/Diktaio Andro Cave in Lassithi, Crete — In winter, open 10:00-17:00 daily. Santorini’s Akrotiri archaeological site reopened on April 11, 2012 and operates 8:00-15:00 in winter. Sounion Temple — In winter, open 9:30 to sunset, daily. Thessaloniki Ancient Agora Museum — Open Tuesday-Sunday 8:00-15:00. Thessaloniki White Tower — In winter, open Tuesday-Sunday 9:00-16:00. Volos Archaeological Museum — In winter, normal hours. In summer, Tuesday-Sunday 8:00-20:00. Hours may also deviate from the listed schedule as employees can decide to open late, close early or cordon off sections due to weather damage, renovation work, under-staffing and unannounced events. No discounts or refunds are guaranteed. *Warning: The Greek National Tourist Organization incorrectly reported that the Acropolis Museum is open daily from 8:00-19:00 on Twitter and its website, and has been caught plagiarizing my website on several occasions. Take caution if depending on official websites for accurate information. 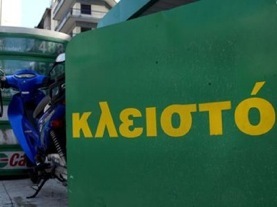 Κλειστό/kleisto or λουκετο/louketo mean closed. All state-run archaeological sites and museums in Greece are closed on legal holidays when businesses and public sector offices across the country shut down and, as friends discovered first hand, on election days. * Privately run locations, such as the Acropolis Museum sometimes open special hours and offer free admission. *Election Days are no longer predictable, with snap/early elections. **Greek Orthodox Easter falls on a different Sunday each year between March to May, and is sometimes different than the date for western, Jewish and Catholic religions. Date shown is for 2015. Free admission or ‘open door’ days for 2013 occur on the dates below, some Sundays and national holidays. March 6: Melina Merkouri, actress and former culture minister. Date of her passing. September: European Heritage Days, last weekend in September, which will be 27 and 28. Sundays: All Sundays from November 1 to March 31; and first Sunday of every month except July, August and September. * If the first Sunday during this period is a national holiday (already free) or legal holiday (closed), then admission is free on the second Sunday of the month. *Staff at the Acropolis of Athens and other tourist sites say that only the first Sunday of each month between November 1 to March 31 are now free, not every Sunday. National holidays: See “National Holidays” section to understand when and what they are. Students from EU countries with an ISIC card. *In March 2014, the Greek PM said free admission would be granted to the unemployed with an OAED card — less than 175,000 people — but did not say when this change would take effect. I will update when known. National holidays are different than legal holidays in that tourist sites open to the public during normal or abbreviated hours and, as stated above, admission is free. *Dates shown are for 2015 but change each year according to the date of Easter Sunday or Pascha. The Ministry of Culture and Tourism does not make an announcement, which is why I listed operating hours of years past. My compliments about your website. Very useful information! FYI: The site that is listed twice is the Archeological Museum of Messina. FYI, I’m the one who noticed it was listed twice, so why repeat what I already pointed out in the article? The YPPO and EOT should do a better job by: a) proofreading their press releases before publication; and b) stop plagiarizing my website. Here’s a question: Why is the GNTO in NY trying to nitpick someone helping tourists with information that you should be providing on a salary funded by taxes I pay? according to the Greek Ministry of Culture website, ‘Odysseus’, (last up-dated 2007!) the Archaeological Museum in Heraklion has been closed since the end of 2006 and according to the Official Greek Tourist Office in London today it remains closed. There is a small temporary exhibition of some important artifacts open nearby. This information appears to have largely been suppressed – at least it is absent from nearly all the relevant web sites and guide books – but will be a profound disappointment to any visitor seriously interested in Minoan culutre. I can only go by what the Ministry of Tourism publishes officially in press releases and cross reference them with a variety of sources listed above, as I do not live or work on Crete. Official websites are unreliable and the GNTO offices abroad are no better, so I don’t use them. I’ll contact sources on Crete when I have a moment to breathe and see what they say. However, I’m the first only (didn’t realize that a number of people copied me) person who published the above information in English and updated recently. That’s better than the EOT/GNTO, considering my taxes are paying their salaries and I’m paid nothing. If there were a few disappointed people, I’ll also wager there were hundreds of thousands who benefited from my efforts. Thank you for this info, it’s been super helpful for planning my trip! Just a note of caution that this page changes as announcements are made, so what applies today may not be true when you’re finally in Greece. If you’re on Twitter, you can add me when you’re here and get real-time info on sites, special events and strikes. I cannot tell you how very useful, indeed indispensable your site has been for me. Not only does it help to plan for visiting, it’s a tremendous way to keep up with historical events in Greece as they unfold. It has been truly a deeply moving saga that continues. The country has such a hard road ahead. Notwithstanding, my money’s on the Greeks. As many have said, they’ve faced worse before. In any case, thank you very, very much. You should be paid because the site is great and the information always important. This is an excellent question, and I’m unsure of the answer because I’ve never visited either and research didn’t turn up any definitive answers. Castles of this sort are usually open to the public, not cordoned off with a gate or charging entry fees. If that’s the case, you can visit anytime though it is recommended to go before sundown because most are not lit. I came across your site after I had booked my trip to Athens for a third weekend in September ! This would be my first and probably last visit to this great city. Keeping my fingers crossed for Acropolis and NAM on Saturday and Sunday! Thanks a ton anyways,your information helped me in not pre-booking any guided tour. Shall definitely browse ur page for current postings. I just wanted to thank you so much for the work you put in to give us all this information. I find it especially useful as I live in Nafplio and when I want to come to Athens I check the site for transport links, and any other strikes and things so that I don’t make the visit in vain. I started the dedicated strike page because English-language newspapers in Greece would publish info on the day it happened or not at all, which wasn’t incredibly useful. Only recently have they given more advance notice in a bid to compete with me. It’s very easy to assist nice people like you, and thank you for your kind words. All best. Hi! Thanks a lot for your very useful and detailed website. I was wondering if all the archaeological sites and museums, like the Acropolis museum are going to be closed on Christmas? Cheers! See the section ‘Closures.’ It’s also listed at “Strikes in Greece,” which is a dynamic page/calendar. Are 8am-3pm the correct normal hours for the National Archeological Museum? Also what are the hours at the NAM on Friday, May 3, which is Orthodox Easter Good Friday? According to the website, it’s 8:00-15:00. As I state in the article above in section ‘National Holidays’, tourist sites open at 12:00 on Holy Friday and close around 17:00. A passport or national ID card. Thank you for your question, and all best. We just visited Marathonas Museum on Sunday and had to pay to get in. When I said to him that I thought it was free on Sundays he said only on the first Sunday of the month. Have they changed their policy? There was a delay in answering because I needed a large block of time to read through all of the Ministry of Culture press releases in Greek for 2012-2013, plus scour news for the past year. I found no official announcements on changing their Sunday policy. However, via on-the-ground comments and conversations with residents and travelers who visited the Acropolis and other sites, many have been told that only the first Sunday of each month excluding July, August and September are now free as of 2013. When I called state-run archaeological sites and museums at random and inquired both in Greek and English on different days, I got a wide variety of answers. This is very common in Greece, which is why I say “results may vary” with regard to everything. In the ‘Free Admission Days’ section, there is already an *asterisked note for Sundays that has been there since January. With your comment, I will expand it to include tourist sites beyond the Acropolis. Thank you for your question and sharing your experience. On Holy/Good Friday, May 3, 2013 you have indicated that the Acropolis admission is free. Normally, a ticket purchased for the Acropolis (12 E) includes the Ancient Agora and a few other places. Will entrance to these places be free also? Thank you.